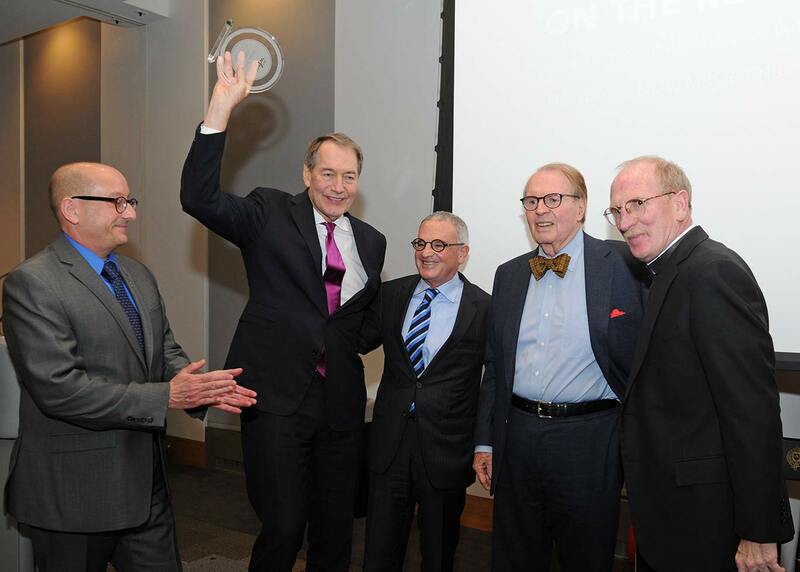 Charlie Rose and Michael ‘Doc’ Emrick were feted Monday evening at Fordham’s Lincoln Center campus at the first annual WFUV 90.7 On the Record celebration of achievement in news and sports broadcasting. Rose was presented the Charles Osgood Award for Excellence Broadcast Journalism, named for legendary broadcaster, WFUV alumnus, and 1954 Fordham graduate. In his remarks, Osgood complimented Rose for his productivity and his recent inclusion by Time magazine as one of the 100 most influential people in the world. From left: WFUV general manager Chuck Singleton, Charlie Rose, Fordham Provost Stephen Freedman, Charles Osgood, and Fordham President Joseph M. McShane. Rose returned the compliment to Osgood, a colleague at CBS. “He understands that a picture is worth a thousand words, but a word can define a thousand pictures,” Rose said. 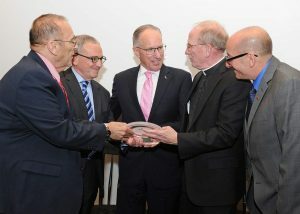 Emrick, a play-by-play announcer for NBC and NBCSN, and former voice of the New Jersey Devils for 21 seasons, was awarded the Vin Scully Lifetime Achievement Award in Sports Broadcasting, named after the Hall of Fame broadcaster, play-by-play voice of the Los Angeles Dodgers, and alumnus of WFUV. Scully, who graduated from Fordham in 1949, lauded Emrick in a taped segment as “nice a guy as ever got into the profession, meticulous in his preparation, and able to effortlessly broadcast hockey matches.” Bob Ahrens, executive sports producer at WFUV, presented Emrick with the award. Emrick singled out Sam Flood, executive producer and NBC Sports, and Lou Oppenheim, CEO, Headline Media Management as key colleagues. “For those of you who are students here tonight, 50 years from now I hope you have two people in your life who take as good care of you as Sam and Lou have done for me,” he said. From left: WFUV executive sports producer Bob Ahrens, Fordham Provost Stephen Freedman, Michael ‘Doc’ Emrick, Fordham President Joseph M. McShane, and WFUV general manager Chuck Singleton. 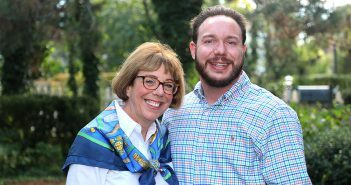 In a post-award discussion led by CBS Sunday Morning correspondent Jane Pauley, Rose said growing up as an only child in a tiny town in North Carolina had a profound effect on him. Emric, when asked how he manages to narrate the action of a game that moves at lightning speed, said that, ironically, it’s easier at the professional level than in amateur sports. “When I was riding the bus leagues for several years, you’d have a 5-1 lead and it would become a 7-5 loss because there would be a lot of mistakes made and a lot of changes of possession. 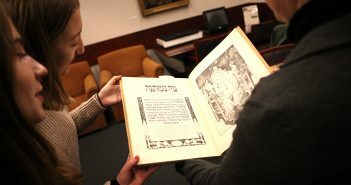 But at the level I get to work at now, its much more predictable,” he said. The fundraising event, which replaced the annual gala that WFUV began celebrating in 2008, raised $200,000. On May 13, 2016, the station will celebrate its musical heritage with “The FUV High Line Bash: A Moveable Feast of Music and Food,” at Milk Studio in lower Manhattan.